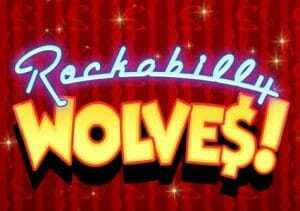 Enjoy a big slice of 1950s nostalgia with a rock and roll-loving wolf in Rockabilly Wolves. This 5 reel, 20 payline video slot has been created by Just For The Win (and Microgaming) and comes with flashy sound and visuals and a cracking feature round that awards up to 12 free spins with sticky multiplier wilds that can send payouts soaring by up to 6x. Play this super high variance game on your PC, tablet or mobile from between 10p and £50 per spin. The design here is simply done but the cartoon-style visuals work very well. Joining the lower value royal values are cherries, 8 balls and the Rockabilly Wolves logo. These spin in stacked formation. Land 3, 4 or 5 of the logo in combination for a payout of 1.5, 3 or 20 times your bet. The same payouts are on offer from the wild which substitutes for everything apart from the free spins scatter. Land 3 of those scatters on the same spin to activate the Free Spins feature. If you land 2 of them, you’ll get a re-spin from the Re-Spin feature and another chance to land the feature triggering third. Once in, the bonus round awards 9 free spins. The free spins symbol that appeared on the middle reel on the triggering spin becomes a multiplier sticky wild during the free spins round, complete with a 2x multiplier. As well as standard wilds, you’ll see sticky and multiplier sticky wilds in play during the free spins. They lock in place for any free spins you have left. The multiplier sticky wilds increase the multiplier by 1x up to a maximum of 6x. Hope to see a sticky or multiplier sticky wild lands on all 5 reels during the feature. In this happy circumstance, an extra 3 free spins are added to your tally. And with all those extra wilds and multipliers, those extra free spins can have a big impact. As you can probably guess given what’s on offer in the feature Rockabilly Wolves is an extremely volatile video slot with top payouts of 6,411 times your bet on each free spin with the 6x multiplier. This big bad wolf can make off with your bankroll. Get lucky in the bonus round though and he can bring the house down. We liked Rockabilly Wolves. The design is brash and ‘in your face’ and that’s matched by the gameplay. If you like high variance action, then you should enjoy bopping with the Rockabilly Wolves. I would also try Quickspin’s Big Bad Wolf which has a similar theme.